I’m getting overwhelmed with all the homeschooling and I knew you could help! My son is 4.5 and is showing an interest in reading, sounding out words, etc. We haven’t done anything super formal; we just practice cutting, coloring, read a lot together, writing his name, fun crafts, etc. He gets overwhelmed when he doesn’t do something perfectly, so we work on trying our best and persevering (I’m like that too!). I’m wondering what you would recommend for writing, reading, math. Does he need something formal for math? I’m interested in Handwriting without tears- do you like it? And what about for reading? I’ve heard about sing, spell, read, and write- what do you think about that? I would SO appreciate your advice and direction! Thank you so much! Talk to you soon! First of all, take it one day at a time & don’t over-do it now. DO NOT try to do every activity, every week. If you only get 3 activities done in a week, that’s ok. Choose ones that your son might like. I think one of them might have a geography activity where you pin the location of each story on a map – throughout the year. There are 3 volumes of FIAR, so you have 3 years worth of reading & activities. The FIAR books are classics. I used FIAR with Hunter during 1st grade. I supplemented with reading, handwriting & a little math. When I see you, I’ll tell you my math story. To me, the most important thing you can do right now is read to him every day. Sing Spell Read & Write has all the bells & whistles. Personally, I think it can be overwhelming to do it all. I now recommend Primary Arts of Language: Reading & Writing. I like it because it is simple and will last more than one year. It ties together learning to read, learning to print & eventually learning to write sentences paragraphs. Also, easy to use. Once you watch the training dvd, there is little prep work. I’m not trying to sell something, but I love everything this publisher has published in the past 10 years. We used IEW all 10 years of homeschooling. Wish they had all the resources back then. Developmentally, kids are ready for language at Luke’s age. Jill Pike wrote the Primary Arts of Language books. 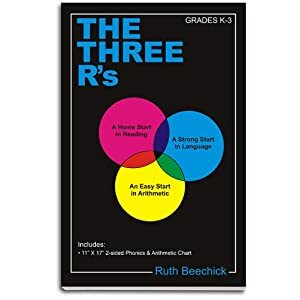 Jill recommends Ruth Beechick’s 3 R’s book. It is excellent for this age group. It’s a short read and encourages you to RELAX. 3. Keep reading out loud to him. 4. Then, decide which direction you want to go. For me personally, if I did it all over again, I would probably use Five in a Row with Primary Arts of Language-Reading & Writing for kindergarten and probably 1st grade. No formal math at this time. There are soooo many resources available to teach reading. Don’t feel like you need to look at all of them to make a decision. Once you find one that you like, use it and don’t compare. If it doesn’t work after 6 months or so, try something different. Please send any other questions…Have a terrific day.